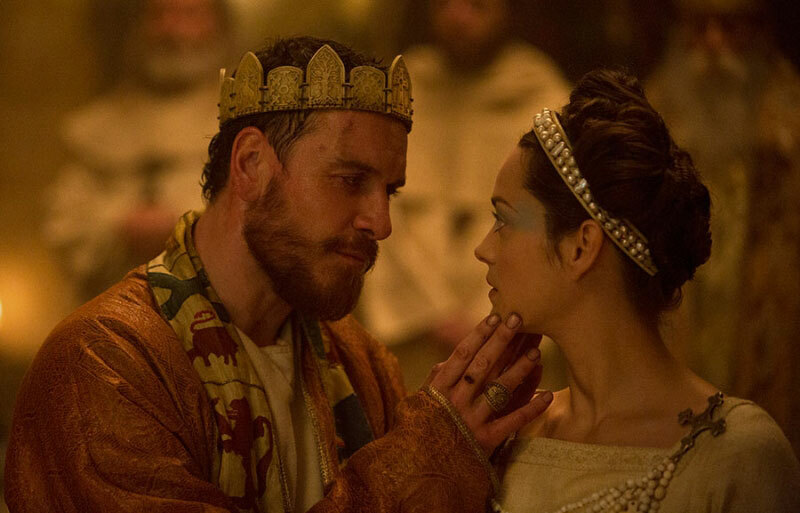 Justin Kurzel’s ferocious take on Macbeth begins and ends with death. 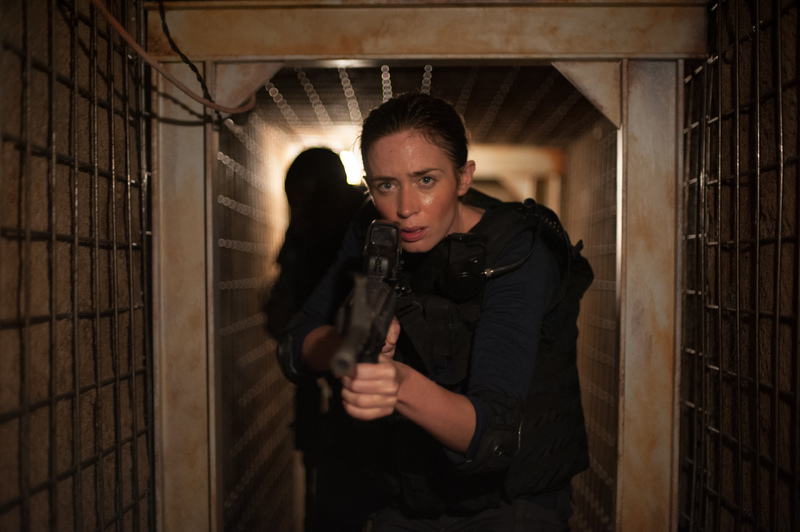 Though its Shakespearean format might isolate those who aren’t well-versed in the Bard’s prose, the film attains a degree of accessibility by dealing in brute force and thematic clarity. We see a Star Wars-esque information trail at the start, but this time the text is in blood red. Jed Kurzel, Justin’s brother, concocts a score that drills and hammers in tandem with bellowing battle cries, bestowing total discomfort upon us. Writers Todd Louiso, Jacob Koskoff, and Michael Lesslie opt to examine how the loss of innocence can incite the immoral side of power, and the results are unflinching. 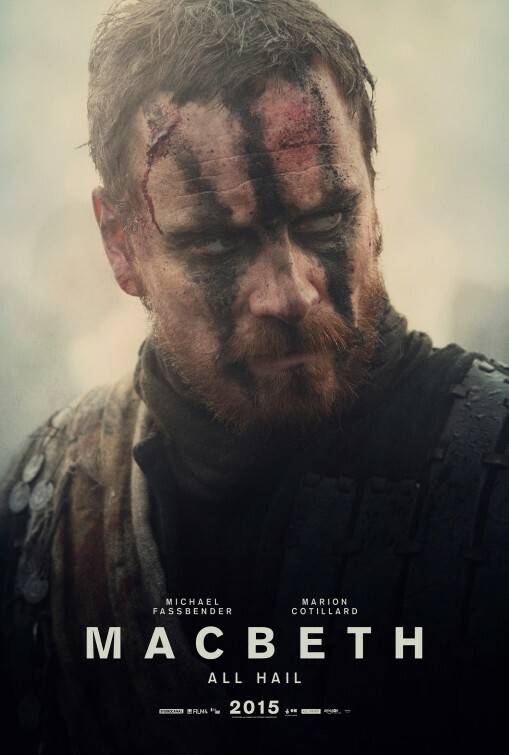 Upon discovering he is destined to be king, Macbeth (Michael Fassbender) weighs up the immediacy of his sure-fire thronage. Lady Macbeth (Marion Cotillard) urges her husband to commit treasonous murder, to speed up the process by killing King Duncan (David Thewlis). Convinced, and perhaps driven by grief brought about by the death of his own child, the Thane of Scotland slays his superior. From then we see the man crumble, haunted by visions of dead clansmen he swore to protect in battle. He becomes a mad king increasingly propelled by unfettered impulsion and corrupted by power (“Full of scorpions, is my mind”). 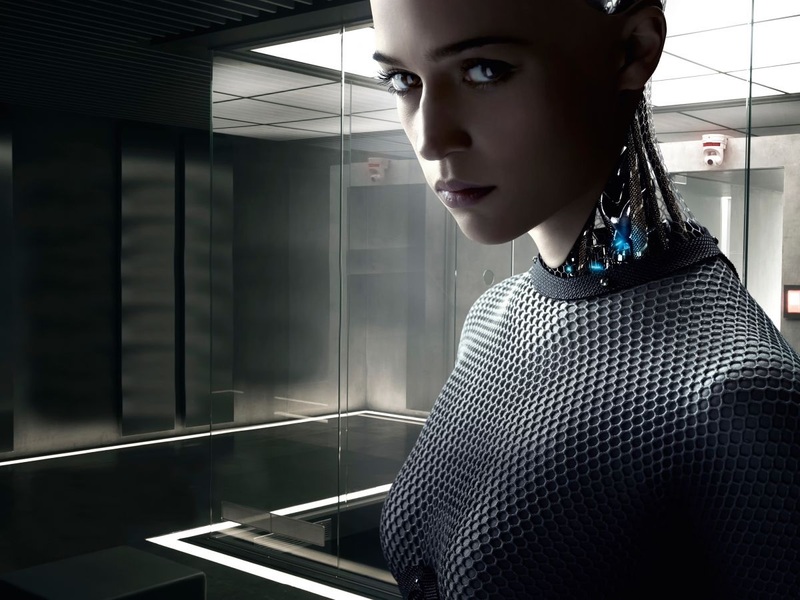 Kurzel’s film will likely appeal to a specific audience; attempts to widen its potential reach are few and far between. Ye who enter devoid of prior knowledge, like myself, will have to contend with a movie that communicates entirely through the diction of Shakespeare. As such, it functions much in the same way a foreign language piece without subtitles would, which might alienate some viewers. It shouldn’t though. Blindly following the story is never too difficult as the actors offer a tangible, precise translation. It’s a testament to the performances of Fassbender and Cotillard in particular that the narrative is sold to us without a verbal parachute. With Fassbender, it’s all in the eyes. His Macbeth, a brooding warrior at the fore, grows bags that darken beneath increasingly absent pupils as the pressure of sovereignty takes over. We never really know where we stand with him — his irreverent actions eventually hit a point of no return, but until then there’s a sorrowful tragedy surrounding Macbeth. In a case of role-reversal, it is Lady Macbeth who must take on the burden of regret. Cotillard is more subtle than her male counterpart. 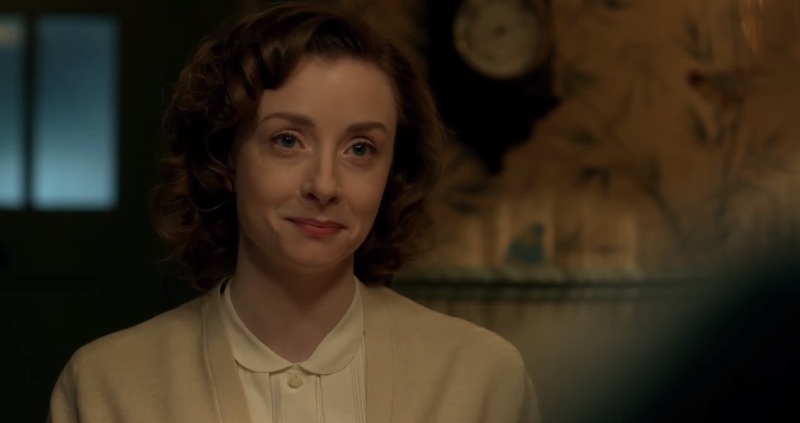 Her words, though often beautiful, are enshrouded in hysteria and pain; the camera unblinkingly lingers on her face during a scene towards the end as the actor speaks with utter command, evoking genuine heartbreak. The framework from which the duo perform is comparable to how Eddie Redmayne and Felicity Jones navigated The Theory of Everything: one exercises true physicality while the other evokes a delicate-yet-purposeful poise. There is often a lingering stillness that is only interrupted by Fassbender’s increasingly perturbed movement, and only Cotillard has the guile to reign in said eccentricity. Friend-turned-foe Macduff, played by an emotionally-wrought Sean Harris, christens Macbeth the “Fiend of Scotland”. Nicolas Winding Refn’s Valhalla Rising might have been a touchpoint for Kurzel, especially in a visual sense: the unquenchable mist, the moorish setting, the breadth of visceral savagery, all invoked. Battle scenes could very well be taking place among the Dead Marshes on the boggy road to Mordor. The Scottish setting, not unlike modern times, is always cloudy, or rainy, or dank, but the aesthetic is never mundane — fog is crimson coloured and dynamic. Cinematographer Adam Arkapaw mixes steady shots with a shaky cam effect, mirroring the vacillating levels of order and chaos afoot. Arkapaw shot the soon-to-be iconic six-minute drug den raid in True Detective season one, and Macbeth revels in similar technical prowess. From sound, to look, to how the film is edited, it’s quite stunning. Scenes showing brutal murder, such as the death of King Duncan, are intercut with instances of solemn hush. A contrast is evident throughout, pitting light against dark (or perhaps it is dark against post-dark). The sound design is worth mentioning too: rallying howls echo with spine-tingling reverence around cavernous cathedral-like rooms. To the credit of those on and off-screen, it never feels like we’re watching a play. In many ways this is a niche offering; much of the verbiage might not make sense, yet you can’t help but stare. And when what you’re staring at is this good, this impactful, words are almost inconsequential. Here are two more anyway: Hail Macbeth! As images of modern Paris caressed by romanticising tones that blare heartily from a trumpet fade in and out of vision, we are made aware of perceived idealism and hereditary sentiment. The French capital has forever been associated with society’s most esteemed virtues; desires of art and literature and fashion and love, a variety of tropes that amalgamate together as one in Woody Allen’s Midnight in Paris. You may find yourself all at sea, or at least caught by the tide as events unfold on screen if, like myself, you’re not a quintessential artiste, or a fashionista, or a literary encyclopaedia. Perhaps some form of salvage anchor exists for those who have experienced the aura of Paris. For this artless dodger though, Allen’s highly nuanced nostalgic whim certainly paints a beautiful picture, but ultimately fails to connect. For Gil Pender (Owen Wilson), achieving success as a Hollywood screenwriter isn’t enough. He wishes to expand his artistic portfolio by penning a novel, but is unfortunately struggling to gather any inspiration. That’s where a wander to Paris offers respite, therefore off the back of a vacation funded by his wife Inez’s (Rachel McAdams) parents, Gil sees hope. Only, hope isn’t all he sees. Having escaped both the drones of an obnoxious family friend and his other half’s party manifesto, Gil finds himself slap-bang amongst the dazzling costumes and enigmatic personalities of an era he vociferously admires, the 1920s. It could be the wine, or perhaps Gil’s quest for inspiration has genuinely uncovered the Lost Generation. Illuminated by quarantined nostalgia, Midnight in Paris firmly sinks its reels into a refined foundation. Gil champions the past, whereas others are either sceptical over his ambition or simply put-off by his tendency to reminisce. He lusts over the 1920s, wishing nature had granted him a spot at the dinner table of said time period. The main character in Gil’s novel works in a “nostalgia shop,” essentially reflecting the writer’s non-peripheral outlook on life. For 15 minutes, the presentation of a man who seemingly has everything going his way — affluence, a beautiful wife and a prosperous career — but remains unable to shake the cobwebs of a non-romantic reality, carries some weight. Unfortunately the narrative somewhat spontaneously retreats a century backwards and kick-starts a conveyor belt of the intellectual. We meet Hemingway, the Fitzgeralds, Dalí and a whole host of other scholars, artists, and fanciful knick-knacks. As Gil interacts with his heroes the problem is never clearer: these people are his heroes, not the audience’s — that would be to assume all Woody Allen outings are observed by a precise denomination, a notion that’s simply untrue given Midnight in Paris made over $150 million at the box office. Traits that may be recognised by artistically knowledgeably viewers otherwise play unsuccessfully to puzzled minds. Perhaps this is not a fault on the filmmaker’s end and an issue that instead lies squarely with those, like myself, who are less well-versed in the lives of Hemingway and company. 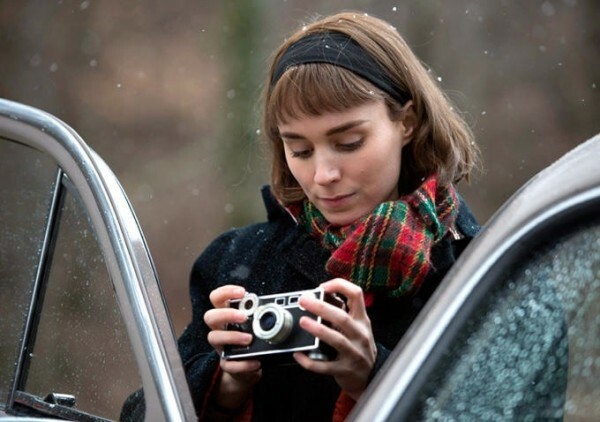 Not every film is shot through a universal lens. 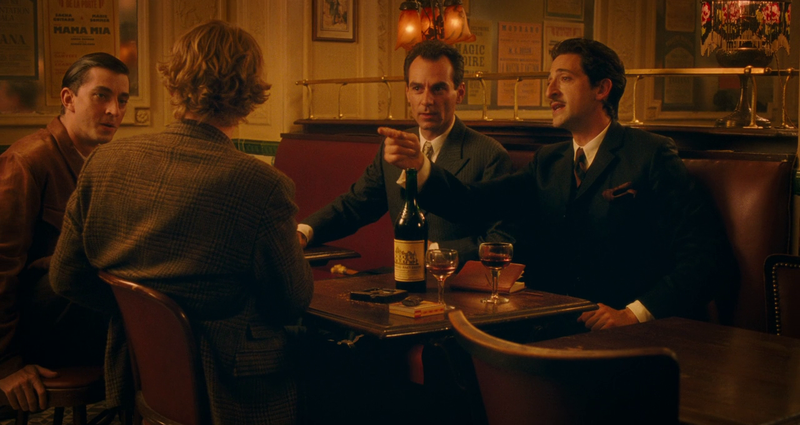 Sadly for us common folk, much of Midnight in Paris renders superfluous as more vague faces appear spouting diatribes that are relayed with concealed significance. The phrase “we should quit the idle chatter” reverberates without implementation. Allen formulates a familiar whimsical tone that brims full of quirkiness. Abiding by this eccentric slant on proceedings, the highbrow collection of 1920s (and earlier) historical figures are all portrayed without too much sincerity. The actors take to the screen like a hungry herd of cattle, displaying enough scenery chewing to clear any field of its green sheen. Everyone seems to be having a blast and although the various classical persons fluctuate in terms of how decipherable they are, an infectious joviality often washes over proceedings. Tom Hiddleston couples with Alison Phil as F. Scott Fitzgerald and wife Zelda respectively, and both are undoubtedly enjoying playing dress-up; Phil in particular accentuates those vowels. Kathy Bates shows up as Gertrude Stein, delighting as ever on cue. Adrien Brody hams it up more than any other as Salvador Dalí in a truly humorous display that overrules any notion of personal ignorance. The film plays up the juxtaposition of modern American consumerist Paris versus romantic Renaissance-laden Paris, a contradiction embodied emphatically by Gil and his wife Inez. Owen Wilson is very good as the inspiration deprived writer turned wide-eyed child in a candy store, whose dream to live in Paris is far from the mind of Rachel McAdams’ Inez. Inez is the typical tourist who sees Paris merely in its present day form as a temporary drop-out zone, and not for its natural inbuilt beauty — unlike her husband, she hates how the city looks in the rain. 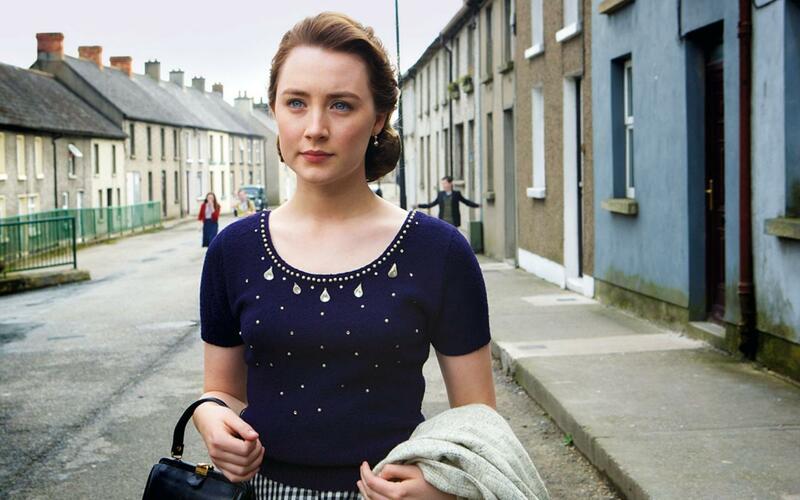 McAdams is fine in her role too, but struggles for breath at times given the nature of her one-dimensional character. The pair’s relationship is never really believable, a sentiment raised by Marion Cotillard’s Adriana in between escapades of Basil Exposition (“I dropped in from 2010″… “You DID?!”). Shot by cinematographer Darius Khondji, the film basks in a wonderfully rich texture that is quite the opposite of the quaint plot which invariably ducks and dives. 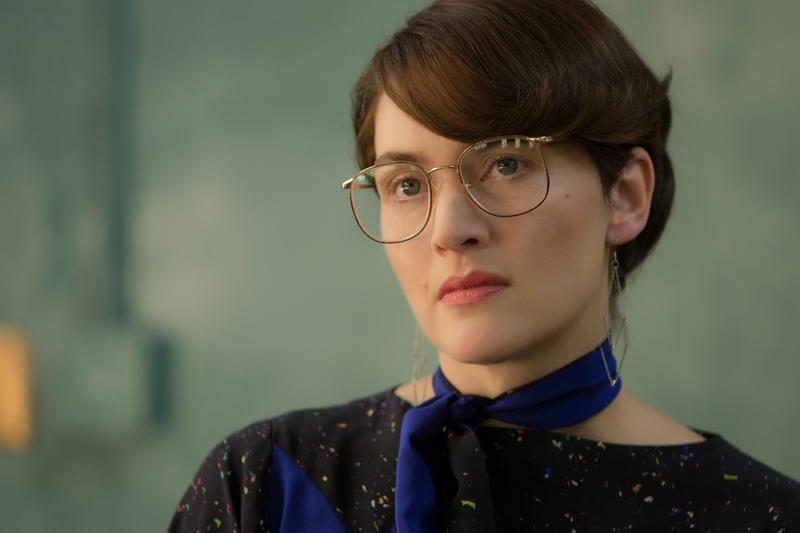 Too many on screen presences mean a few are lost in the shuffle; antiques dealer Gabrielle feels like a character without conviction, and Inez’s mother, other than manifesting as a dead ringer for Cate Blanchett’s Jasmine a decade on, has very little to do. After traipsing through party after party full of observant pundits you begin to wonder why nobody is picking up on Gil’s 21st century fashion sense. 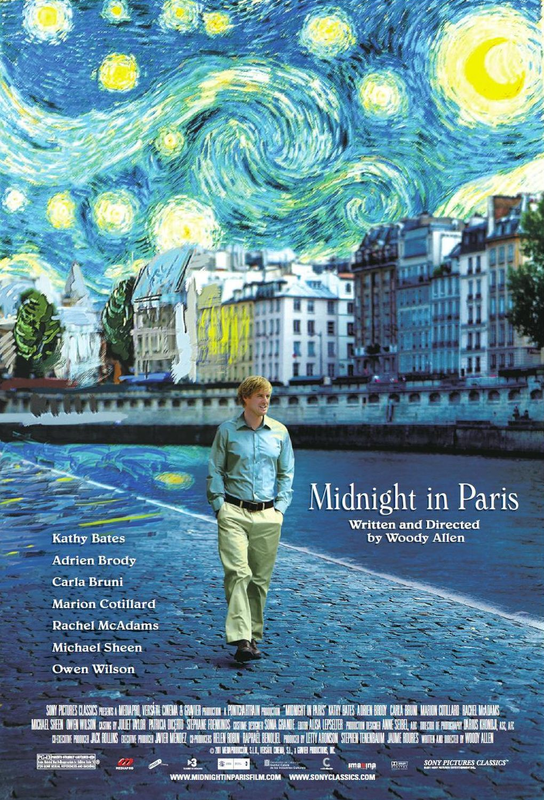 Midnight in Paris’ admirable intentions are there for all to see, but perhaps only a few will fully comprehend. That is not to say the film is lacking in watchability, for a host of energetic performances alongside a narrative that accommodates more than a trace of intrigue through its humorous comparison in culture certainly offers delight in small doses.